Join us as we welcome and honor the 2019 board of directors. The event, held at the beautiful Hammock Beach Resort, kicks off with cocktails. There will be both live & silent auctions filled with hotel overnight stays, golf packages, and other treasures donated by various Chamber members. Following a delicious meal, the Chamber will install the new 2019 Board of Directors, honor retiring board members and hear from incoming Chair, Allen Goodman. This is by far, the must attend event of the year! Tickets are $90 per member, $100 for non-members and $810 for a table of 10. 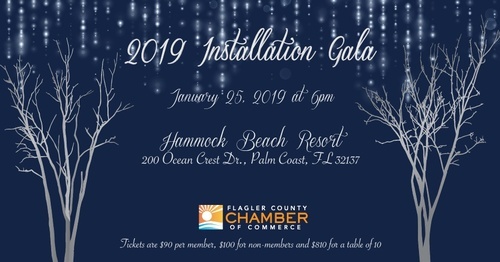 Please call the Flagler County Chamber of Commerce to purchase your tickets!